Located at 322 meters above sea level, on top of three hills, Siena is one of the most beautiful and oldest cities in Tuscany, rich in monuments, noble palaces, museums and art. 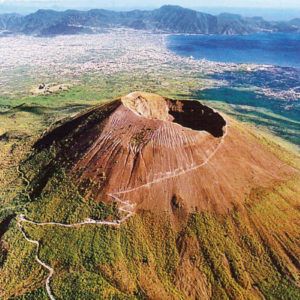 Its history is very long, dating back to the ancient Etruscans, as shown by numerous and interesting archaeological finds. Legend has it that Siena was founded by Senio and Aschio, sons of Remus. The two escaped from Rome bringing with them the simulacrum of the Roman she-wolf, symbol of the city. Senio and Aschio founded Siena at the end of a legendary and very long “Palio alla lunga”. The sign of the new city will be white and black like their horses. But this, as we said, is a legend. History, however, says that Siena was originally a small Etruscan village, later subdued by the Romans. 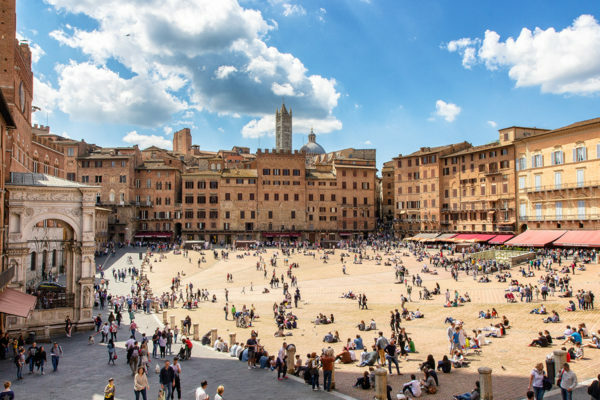 In the Middle Ages, over the years, Siena became an important commercial center, (thanks also to the construction of the Via Francigena, the road that linked Rome to France), there was also a notable increase in population and urban core. The inevitable clashes with Florence also began, as both cities tried to expand their territories. Moreover, Siena was fundamentally Ghibelline, while Florence was of Guelph spirit. There were numerous clashes and several battles between the thirteenth and fifteenth centuries that finally saw Florence prevail. Siena then, with the removal from the city of the Ghibellines, was incorporated into the administration and the Florentine territory. Despite these events, in the years between 1150 and 1300 there were many great artists who were involved in the construction of extraordinary monuments, among which one of the most important is definitely the Duomo. In 1295 work began on the construction of the Palazzo Comunale which was completed in 1340. 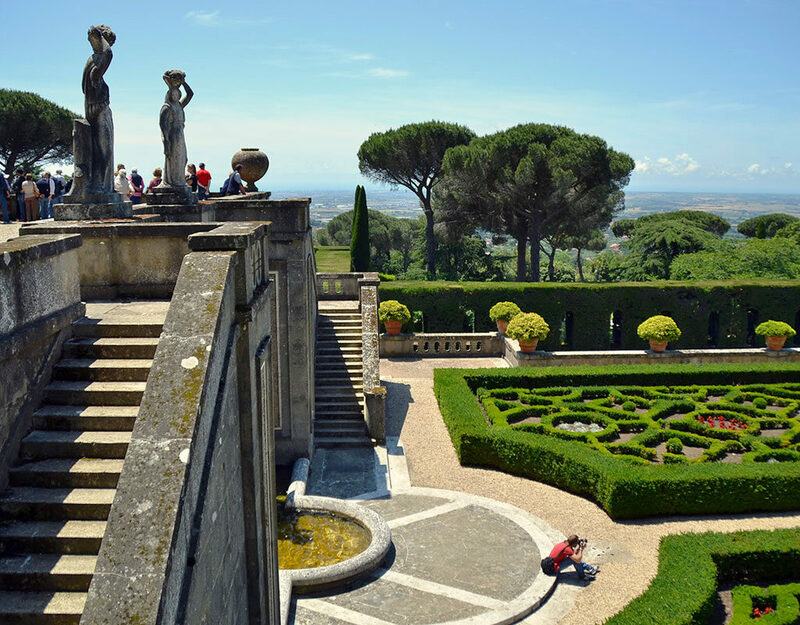 It is the oldest public building in Italy that has retained its original function over the centuries. Next to it was built the Torre del Mangia, 102 meters high, a large architectural work completed in 1348. In the field of painting and sculpture in addition, the Sienese masters were distinguished by their skills and artistic skills that preceded in some ways the period of the great Tuscan Renaissance. 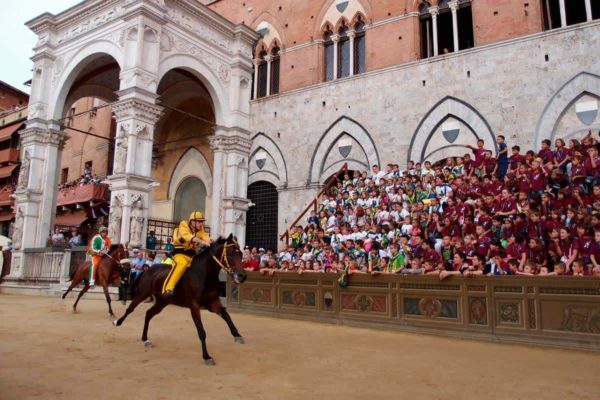 The Palio, the most important and famous Sienese festival, has become the symbol of the past greatness of the city and the districts, first very numerous, today there are 17, have remained the custodians of an identity both collective and belonging to each single district. Siena, in the heart of Tuscany, stands in the silence of vineyards and endless hills. Any visitor, even the most hurried, can appreciate the historicity of the small and winding alleys, the noble palaces that are the setting for this wonderful city of art. 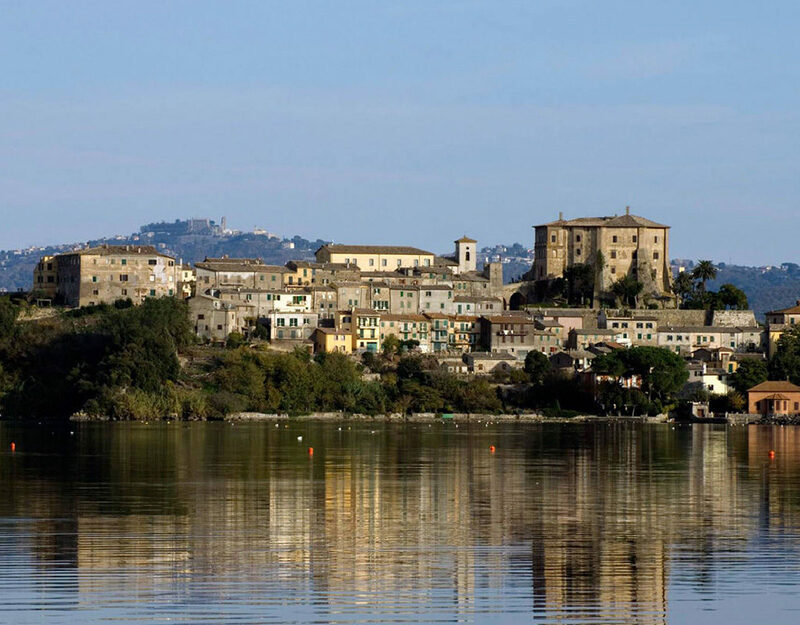 The Sienese territory allows a wide choice among the various itineraries to discover uncontaminated natural landscapes, archaeological sites, perfectly preserved medieval villages, in cities such as San Gimignano, Pienza, Montalcino, Montepulciano. 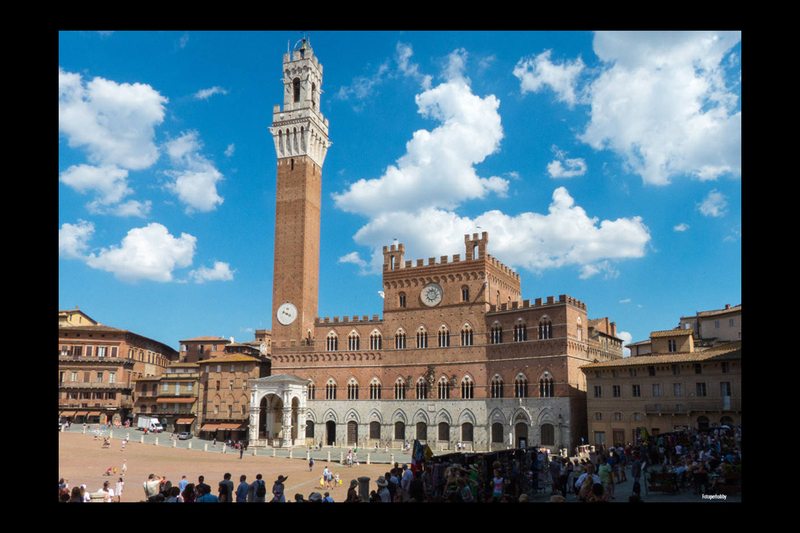 The city of Siena is rich in monuments, palaces and buildings that represent a fantastic testimony of its long history and medieval tradition. Below is a list of some of the most representative and important buildings, which certainly deserve to be visited. The Palazzo Pubblico of Siena (also called Palazzo Comunale), overlooking Piazza del Campo, is considered one of the most prestigious examples of Gothic architecture in the world. Its construction began in 1295 and ended in 1340. It is the seat of the municipal administration offices, and is built in stone, in the lower part, with a succession of typical Sienese arches, while the upper part is in bricks with three-light windows. On the left side of the Palazzo Pubblico stands the Torre del Mangia, 102 meters high, finished building in 1348 and considered as a real engineering miracle. It is one of the most beautiful and famous Italian medieval towers. Its name derives from Giovanni di Duccio, known as Mangiaguadagni or Mangia, who was the first bell-ringer of the tower charged to mark the hours. 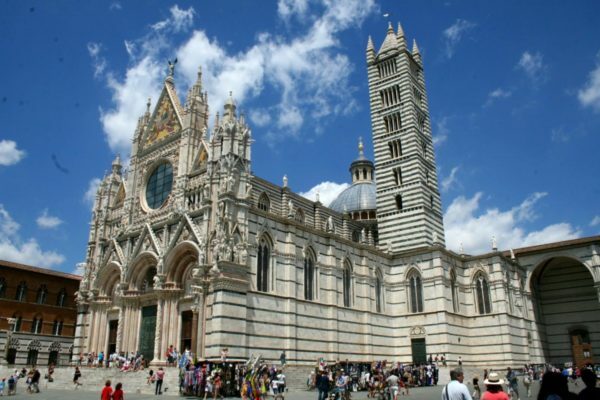 The Cathedral of Siena is a splendid example of synthesis between the Romanesque style and the Gothic style. 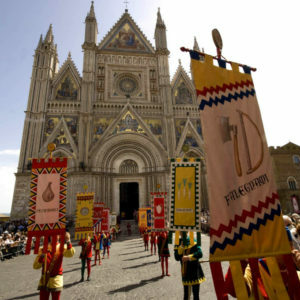 Its construction began in the twelfth century to glorify the strength and wealth of the Tuscan municipality. Giovanni Pisano is the author of the lower part of the facade of the Duomo, with its Romanesque-Gothic style and with pointed arches surmounted by cusps. White marble was used for the cladding with green and red marble inserts. The side portals are characterized by the bas-reliefs of Tino da Camaino depicting S.Anna and S.Gioacchino. In the upper part of the facade, which was completed about a century later and is all in flowery Gothic style, the rose window surrounded by busts of the patriarchs stands out. The interior of the Duomo then, 90 meters long and up to 50 meters wide, is certainly the most surprising and characteristic part. It is in the form of a Latin cross, with three naves divided by columns with white and black bands surmounted by round arches, and is illuminated by large windows with three-light windows. Another element of great importance is the floor of the Duomo, divided into squares, which was decorated by great Sienese and Tuscan artists, with several scenes in graffiti and inlay. The Palazzo Piccolomini of Siena, also known as the Palazzo delle Papesse, was built to a design by Bernardo Rossellino between 1460 and 1495 for Caterina Piccolomini, sister of Pope Pius II. The building is on three floors and is a typical example of Renaissance architecture, with the ground-floor stone facade on the ground floor, while the upper floors are characterized by the presence of mullioned windows, which are very reminiscent of the Florentine buildings of the same period. 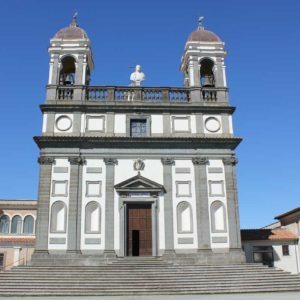 At the end of the seventeenth century, the building became the seat of the “Collegio dei Tolomei” (Institute founded by Celso Tolomei in 1629, whose task was to educate young nobles) and then in 1858 it houses the State Archives. In 1884, after numerous modifications and restorations, the building became the headquarters of the Bank of Italy, and it is also in this period that the neo-Renaissance frescoes that decorate some rooms on the main floor date back. On the second floor there is a terrace from which you can admire the so-called “facetone” of the Duomo from a certain angle, while from the upper floor you can see a splendid view of Siena from above. Finally, since 1998, the building houses the “Center of Contemporary Art”, supported by the Municipality of Siena, which has among its main objectives, that of promoting Italian and international contemporary art through exhibitions, meetings and events. Palazzo Chigi-Saracini is a Gothic-style building, located between the Duomo and Piazza del Campo, and is home to the illustrious Chigiana Music Academy, the school of musical studies established in 1932 and attended by students of all the world. The Palace was built between the twelfth and fourteenth centuries and was the seat of the Council of the Republic of Siena. The first floor of the building is built of stone, while the second one is made of bricks with two orders of three-light windows and with a broken tower on the left side. Then there is a courtyard, with a well in the center, and with a portico embellished by several frescoes, while inside the building, extensively renovated in the eighteenth century, there is a splendid concert hall and a gallery containing a vast collection of works of art belonging to the major Italian artists, and in particular Sienese, such as Sassetta, Neroccio, Beccafumi, Botticelli, etc.